Dolphin and Sailfish Are Here! Nice dolphin caught by this excited angler on our drift fishing trip aboard the Catch My Drift. It’s a great time of year to come fishing in Fort Lauderdale. This time of year, we get the cool, Easterly winds come in and with them comes a plethora of mahi-mahi and sailfish. This past week, we’ve had off-the-scale mahi-mahi action. The east winds are blowing the flying fish closer and closer to shore. Following right behind them are the mahi-mahi. The mahi-mahi and flying fish end up right in on the reef where it becomes a feeding frenzy. Our sportfishing trips, which lean heavily on trolling this time of year, really crush the dolphin. When trolling, you are mobile, you can cover a lot of territory with your full bait spread out and when you do find the fish, you can stay right on top of them trolling in circles. Our drift fishing trips are catching the dolphin too. They don’t catch as many, but they are always ready to cast a pitch bait out if they see a dolphin swim up to the boat. 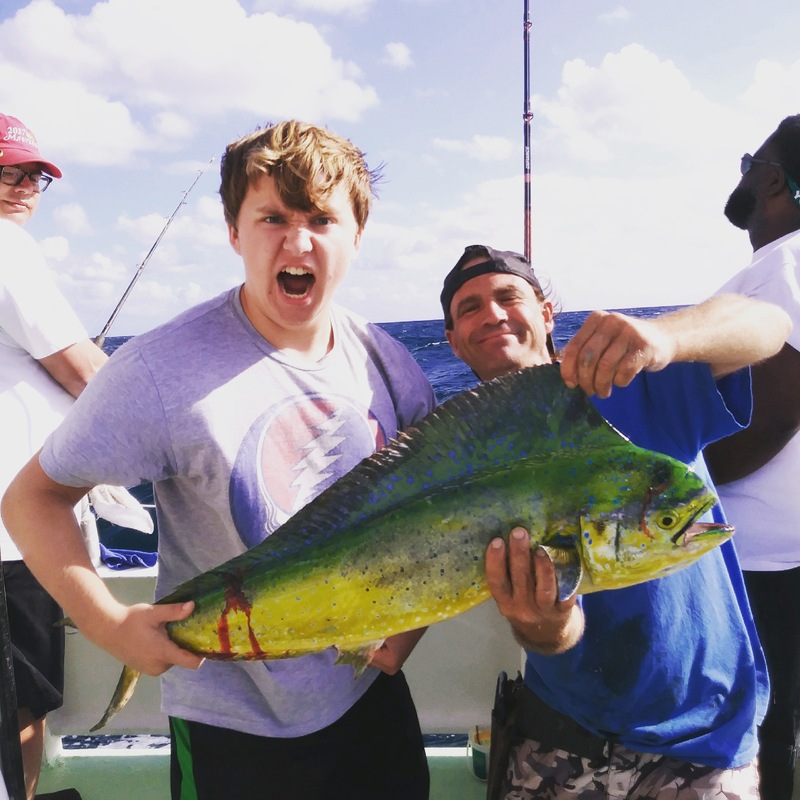 November is probably the second best time of year for catching mahi-mahi dolphin, April and May being the all-around best. Tunas are mixed in as well to get their fair share of the flying fish action. We catch a lot of 5-10 pound blackfin tunas among the mahi-mahi when we’re trolling. It’s a seafood buffet and it’s all you can eat! Nice dolphin and tuna caught by these boys on their deep sea fishing trip. Sailfish action is heating up too. The sailfish are kind of late this year. 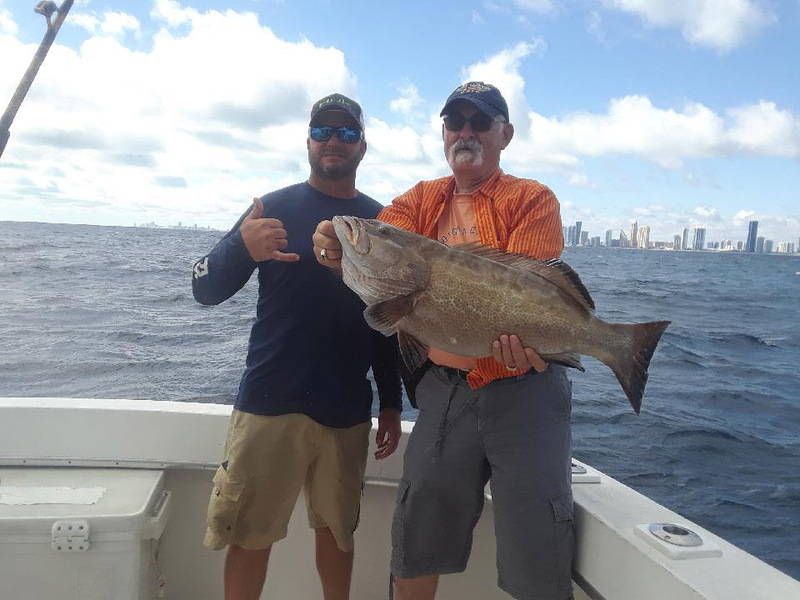 We didn’t catch many in September or October, which could be because we weren’t fishing that often due to Hurricane Irma and the Fort Lauderdale International Boat Show. But with that all over, we’ve been fishing every day. 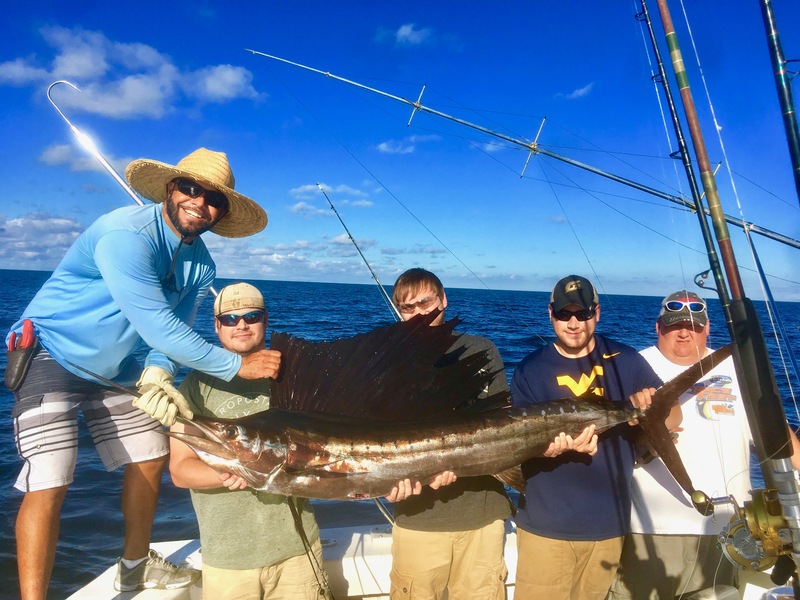 As soon as November hit, the sailfish started biting. Lots and lots of the 4 foot sailfish (and that is small for a sailfish) were coming up and swatting our trolling baits around trying desperately to get the baits in their mouths. Bigger sailfish are much for adept at catching and eating our rigged trolling baits. The small sailfish can catch and get the bait down their mouths, but it takes them a lot of swipes to get it down their mouths. The big sailfish are now showing up and we’ve started to get some of the big ones these past few days. November is the first month of stellar sailfishing, which continues through the end of February. Big game fishermen from all around the world come here to Ft Lauderdale in hopes of catching sailfish, which are probably the most sought after gamefish in the world. Nice sailfish caught by these guys on a bachelor party fishing trip out of Fort Lauderdale. 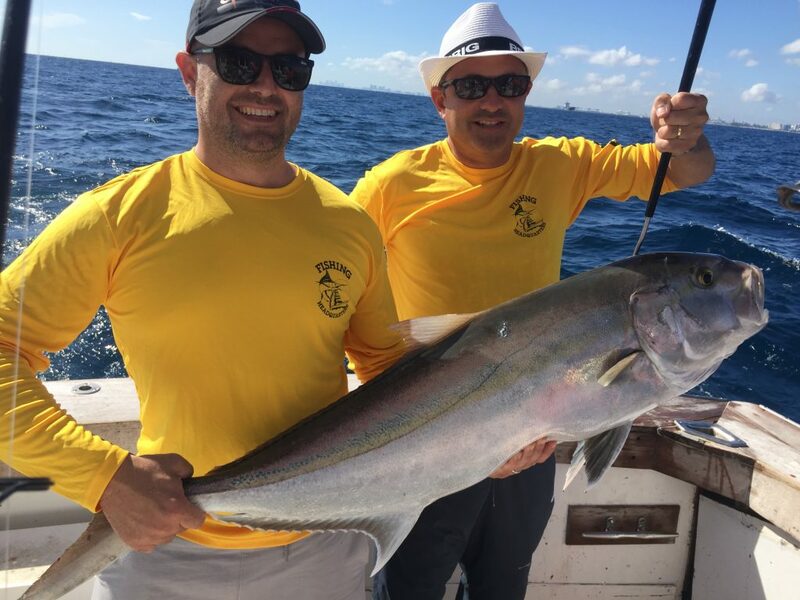 While sailfish and mahi-mahi are the most popular fish that people desire to catch, mainly because of their colors and the fact that put on an awesome jumping display when on the line, there are other awesome big game fish to be had. Fort Lauderdale has hundreds, if not thousands of shipwrecks that are sunken off our coast. Fishing around these shipwrecks is a lot like taking the bait right to dining room. Rather than trolling where you are driving around looking to find the fish somewhere, when wreck fishing you are going right to where you think they are going to be and dropping a live bait down on top of their head. A lot of the big bites that we get around the wrecks happens as soon as the bait touches the bottom. Big groupers, amberjacks and cobia don’t let a live bait swim around for very long before they pounce on it. Almaco jacks, barracuda, sharks and snappers and also nice big game fish that we catch near the wrecks using the same technique. With the great action we get trolling the reefs, we don’t spend a lot of time hitting the wrecks, but on a slow fishing day when there isn’t much action on the reef, spend the last hour on top of a shipwreck can often make a slow day of fishing into an exciting one. The last thing I want to mention in this report is our drift fishing trips, particularly our night anchor trips. November is a great month for drift fishing in Fort Lauderdale too. 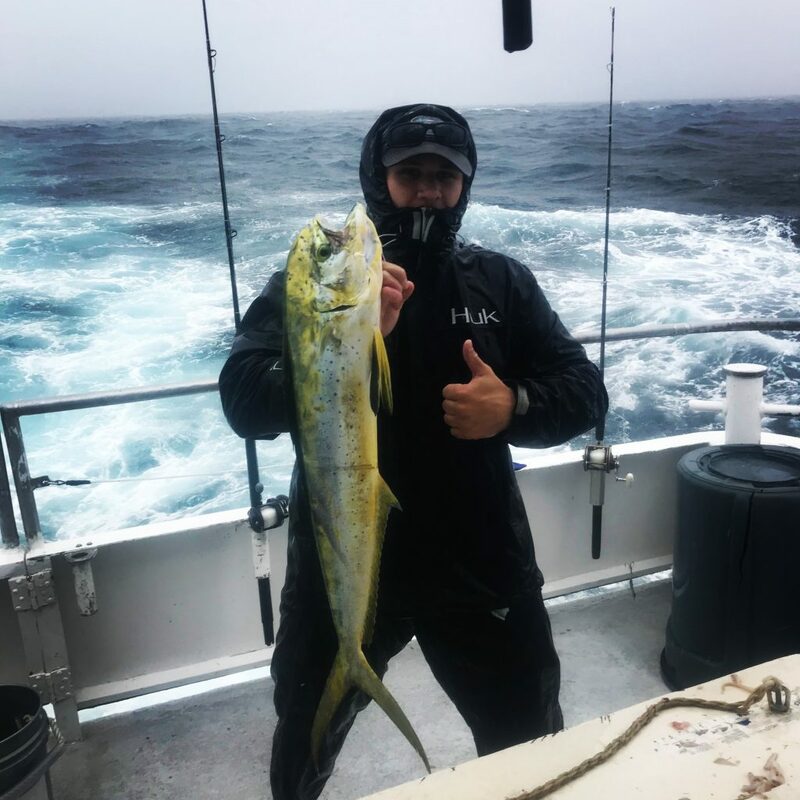 The action on snappers is generally very good, some kingfish are biting and we get some odd-ball stuff we normally don’t see on the drift boats such as mahi-mahi and cobia. Action on the snappers (yellowtail, mangroves and muttons) is very good on the day and night trips. 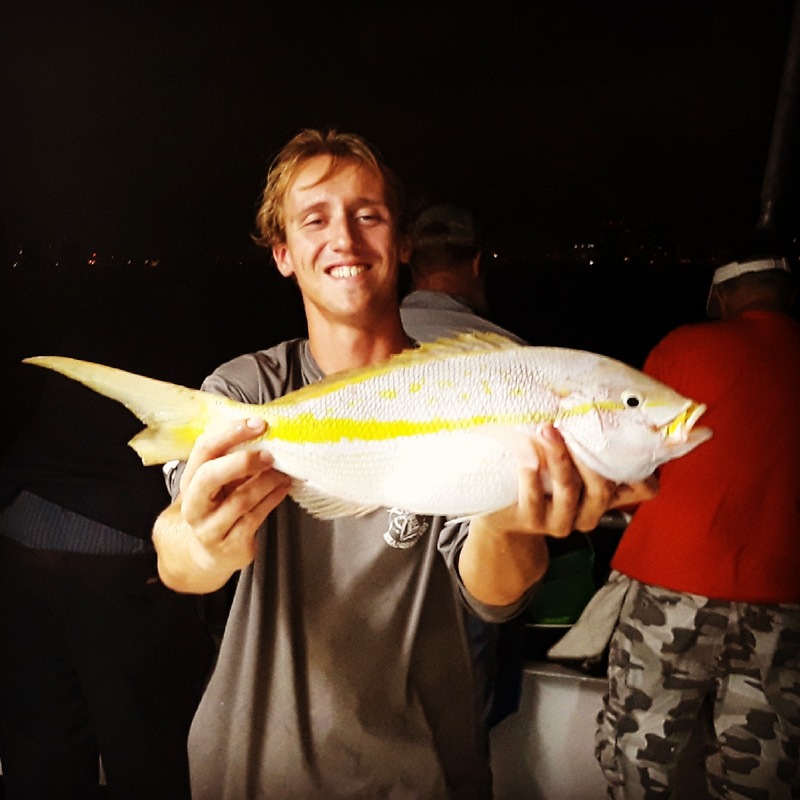 The day trips catch more mutton snappers but the night trips get the most amount of snappers with lots of yellowtails and mangroves. My favorite snapper trips are the afternoon and night trips. They seem to catch the most snappers and come in with good catches of them the highest percentage of trips. Groupers are biting especially good this month too, much better than last year. This week I’ve seen some big keeper-sized black groupers and red groupers hit the docks. We have 2 more months of good grouper fishing before the season gets closed on Jan 1. I foresee some good grouper fishing this month and next. Nice black grouper caught on our deep sea fishing charter in South Florida. 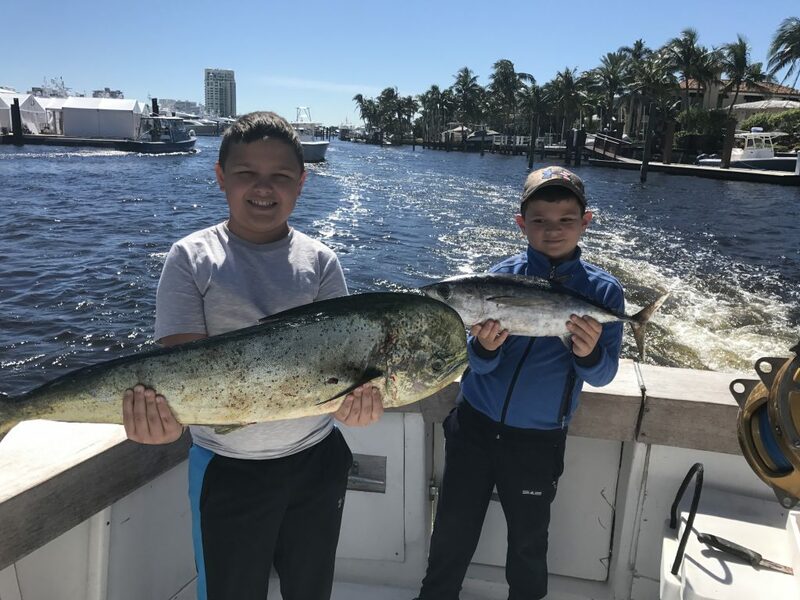 It’s a great month for fishing the Fort Lauderdale area. There’s lots of action to be had, lots of good eating fish and some big game fish too. There’s something for everyone this month. Good luck out there on your fishing trips. I’ll sea ya on the water. Nice yellowtail snapper caught night anchor fishing aboard the Catch My Drift. Nice dolphin just caught drift fishing aboard the Catch My Drift. 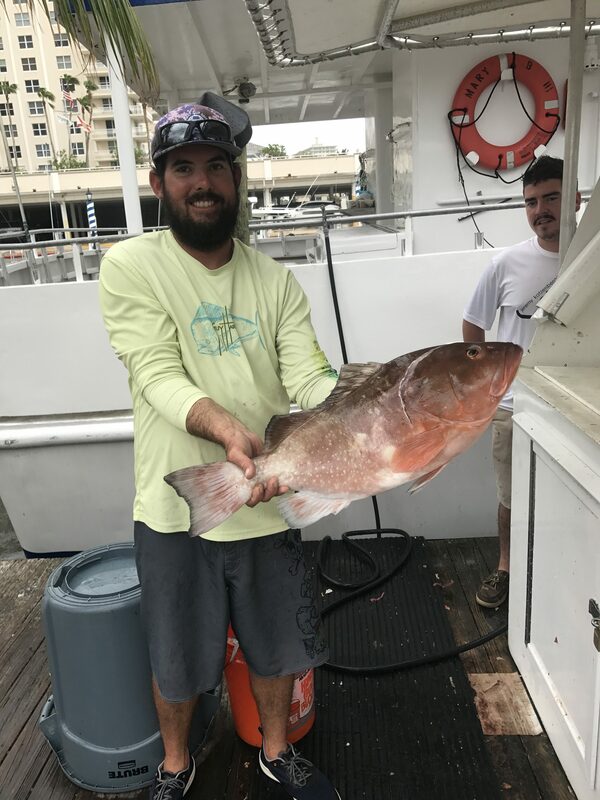 Nice red grouper caught drift fishing aboard the Catch My Drift.